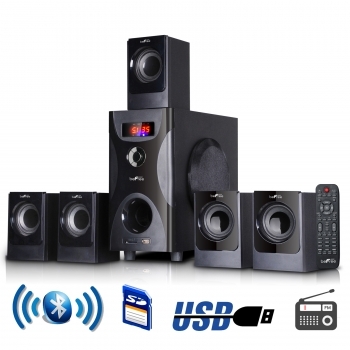 Enjoy the ultimate home theater experience with with beFree Sound's 5.1 Channel Surround Sound Bluetooth Speaker System. This speaker system is sophistically designed, featuring a sleek look and smooth sound. With Bluetooth, USB, SD and FM radio capability, the system offers the best possible listening options for your enjoyment.